Earlier this year Kinesis UK launched their new endurance road bike, the ‘RTD’ – Race The Distance – with the endurance racer in mind. 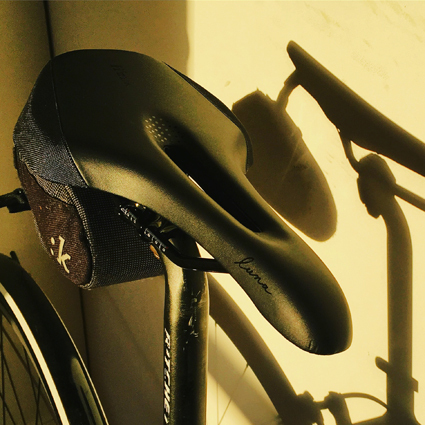 The RTD is designed for repeated days in the saddle, providing all-day comfort without compromising on handling and speed. I was lucky enough to get my hands on one in late September and I’ve been racking up the miles on it ever since. I didn’t want to rush to review this bike, I wanted to take some time to try it out on a few long rides in a variety of conditions and really get to know it before I committed pen to paper – or whatever the digital equivalent is – and I’ve recently crossed the 1000 km marker, so I now feel qualified to share my views with you. Now I know that you’re probably thinking that because I’m a Kinesis brand Ambassador, I have to only say good things about the RTD. But If I didn’t like it, I wouldn’t ride it, so the fact that I’ve ridden over 1000 km on it in just a few months at the ‘back-end’ of the year ought to tell you something. 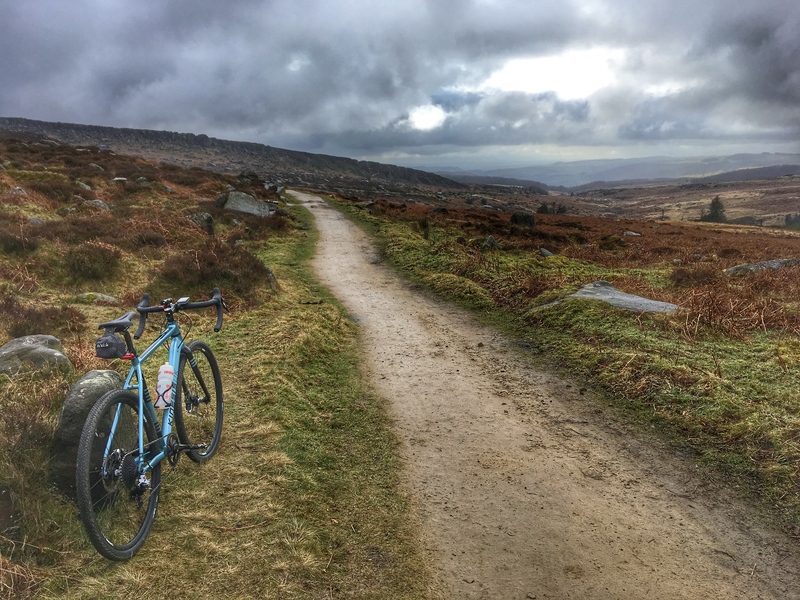 I’ve done long days in the saddle in all weathers, I’ve ridden it fully-loaded with bikepacking kit and also taken it out on the Sunday club run with just a water bottle added. I’ve completed a number of 200 km-plus rides on it now, mainly in wet conditions, and have to say that I’ve really fallen in love with this bike. I never thought I’d find a bike as comfortable as my Racelight TK3 to ride over long-distances but the RTD is everything that my Racelight is and a lot more besides. The RTD’s lightweight Scandium alloy frame is designed for riders just like me who spend long days on the bike, often with luggage attached. Kinesis have spent a lot of time developing their Scandium tubing, using a method of production that allows them to create lighter tubes and more intricate shapes, resulting in a lighter and stiffer frameset. The RTD’s frame geometry has been tweaked to make it slightly more laid back than the Racelight, in order to provide all-day comfort, but not so relaxed that it compromises on speed. The scandium frame is accompanied by the new Columbus Futura fork, a lightweight, 12 mm thru-axle, carbon monocoque fork that provides masses of clearance for a road bike, allowing up to 34c tyres, which is also drilled to take a full mudguard. I’ve been riding my TK3 since 2013 for all of my long-distance events and audaxes and have always been very comfortable on it but during TCR no.5, on some of the sketchier road surfaces that we encountered, I felt limited by its inability to fit a wider tyre, especially with a mudguard fitted. 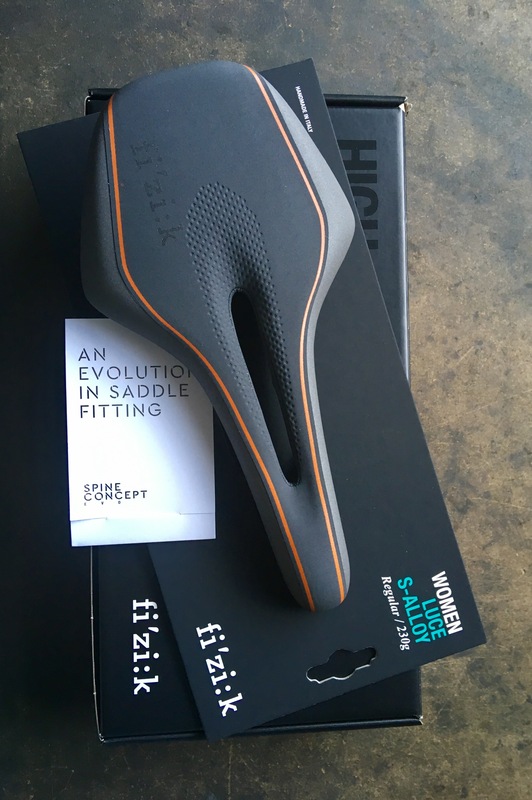 This limitation became even more apparent to me earlier this year when I purchased my Tripster ATR which I primarily bought for riding gravel but, because of the ability to fit a wider tyre, I ended up touring on last year with 40c slicks fitted. However, despite a comfortable and really fun trip, it lacked the responsiveness of a road bike on the tarmac. My current set-up on Beeley Moor – 30c tan wall Challenge tyres and full ‘Fend-Off’ mud guards. For me, the RTD is the perfect solution – a light frame with endurance racing bike geometry, which is like a supercharged, updated version of my TK3, but with the capability to take a much wider tyre, providing a more comfortable ride and the versatility to tackle less-than-perfect road surfaces and the odd bit of gravel when required. 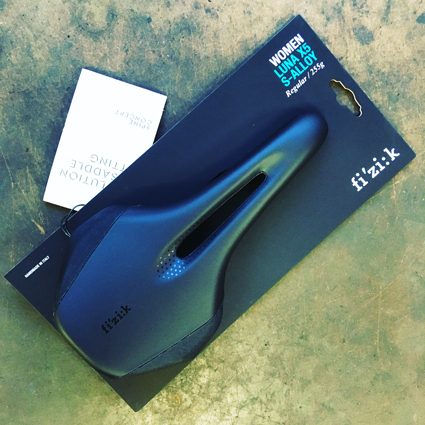 I’ve found that it handles well on descents, feels light and responsive when climbing, accelerating and cornering. It feels very stable too, even when loaded up with bags – the perfect bike to ride endurance races like The Transcontinental Race on, which is exactly what Kinesis set out to create. I’m currently riding my RTD with a 30c tyre and Kinesis Fend-Off full mudguards which is a great combination for a winter road set-up. I recently rode an audax in bad weather that featured a 1.5 km section of rough, puddle-filled, cinder track and while quite a few of my fellow riders stuttered and struggled along on their 25mm tyres, I just breezed on through on the RTD, soaking up the lumps and bumps of the rough surface without getting covered in mud – I might have been a little smug about it at the time. The odd dirt track poses little problem for the RTD. I opted for a flared handlebar as I’ve has an issue with being able get down on the drops with a bar bag fitted on a conventional handlebar. The Ritchey Evomax bars are a good fit for me. I like a wide bar for stability and the flare enables me to get down onto the drops even when I have my large 14 litre bar bag fitted. Aesthetics are important too and the attention to detail is another stand-out feature of the RTD for me. That striking monochrome paint job isn’t just eye-catching, it’s also functional. All the of black and striped areas are frame bag contact points, which allows me to protect the frame against rub with as much tape as I need without spoiling the overall look of the bike, whether the bags are on or off. The internal cable routing guides the cables through the head tube rather than the down tube which gives an overall cleaner look, and ensures that cables don’t hinder fitting bags to the frame. The frame also features three bottle mounts – essential on hot summer days in locations where amenities are sparse. The RTD can be configured to run mechanically or with DI2, with a 1x or 2x set-up. I’ve gone for a Shimano Ultegra R8000 mechanical 11-speed drivetrain with a semi-compact chainset (52-36) and an 11-32 cassette. I chose to stay mechanical mainly because it’s one less thing to worry about needing to charge up if I’m riding in the middle of nowhere and get caught out, but that’s purely down to personal choice. It’s also the first time that I’ve had hydraulic disc brakes on a road bike. Prior to riding the RTD, I’d often argue that I couldn’t see really see the need for disc brakes on a road bike, but I’m definitely a convert now. The Ultegra hydraulic disc brakes have great stopping power and modulation, especially in bad conditions. I’d describe myself as a nervous descender and a little too heavy on the brake, but on the RTD I’m definitely improving. My hands no longer feel like they’re about to seize up at the bottom of every long hill and I feel much more in control of the bike. This has given me the confidence to build up more speed on the descents and attack the corners. Fitting good quality tyres also helps. The Challenge Strada Bianca tyres are, as you can probably tell by the name, made for the gravel roads of Italy but I have found them to be fast, lightweight and grippy on the road – a great all-round tyre that rolls really well and are comfortable too, so they’ll be staying on the bike for the rest of the winter and beyond. They’re hand-made and I have to admit that they’re not the easiest tyre to fit as they’re almost flat when they arrive in the box – it took three of us in the workshop to wrestle them on. However, they feature a puncture protection strip which has been doing it’s job very well so far, so I can’t tell you yet how easy they are to get on and off after being sat on the rim for a while but I’m hoping that they’ll have stretched a bit by now. If I’m totally honest, when my RTD arrived, I didn’t see myself riding this shiny, new bike throughout the winter months. I expected to do a couple of 200km audaxes on it just to see how it handled, then put it away until the spring and carry on riding all of my winter miles on my beloved old Racelight TK3 but I’m afraid that since I took delivery of the RTD my TK3 has been steadily gathering dust in the hall. In short, I’m hooked. Aside from aiming to qualify for Paris-Brest-Paris, I’ve not made any further plans for my long-distance adventures in 2019, but you can be sure that wherever my plans take me, I’ll definitely be riding my RTD. In turn, that’s all had a negative effect on how I feel when I’m on the bike. Still, it would be unfair to say that I haven’t had some great adventures on my bike this year. I’ve worked as a cycle tour guide in Scotland, ridden in the Alps and had a really memorable experience managing Control Point Three in Poland on this year’s Transcontinental Race. I’ve visited some fantastic places and met some lovely people but, from a personal goals point of view, 2018 hasn’t felt great at all up until now. Thankfully, throughout this year’s ups and downs, I’ve had my Randonnee Round the Year attempt ticking along in the background and now that it’s complete, I’m so glad that I stuck with it. As personal achievement goals go, 2017 is going to be a pretty tough year to beat. This time last year Julie and I had just found out that we’d been successful in securing a place in the Transcontinental Race and were both surprised and slightly in shock. If I’m honest, that state of mind stayed with both of us right up until the moment we were lining up to climb the Muur on the evening of July 28. As much as we’d both love to have another crack at the TCR (as we are both convinced we could do it faster now that we know what we’re dealing with), this year it’s just not going to be possible for us, mainly because of constraints in time and money. I work for a cycling social enterprise based in Sheffield. Summer is our busiest time at work and I can’t justify taking off another month in July / August. There are only 12 of us in the team, and they’re all keen cyclists too, so it wouldn’t be fair for me to leave them to pick up my slack two summers in a row. I also spent a big chunk of my savings on the TCR last year, not just on the race itself but on new equipment, a new groupset for Teacake, jabs, insurance and preparation, it all adds up. That said, I’m still planning to have plenty of adventures on the bike in 2018, they’ll just be a bit shorter and a bit cheaper but hopefully just as exciting and challenging. As ongoing goals go, I still have to complete my current attempt at Randonneur Round the Year – an audax challenge to complete a 200km audax every month for 12 consecutive months. I initially started 2017’s attempt in February but I forgot to validate a leg of the TCR during August so I had to start all over again in September and therefore have another eight to go. RRtY is a great way to stay motivated to keep riding throughout the winter months, although I’ve not planned when I’m riding January’s yet so I need to pull my finger out really. I also missed out on my Super Randonneur in 2017 – another audax challenge where you complete a 200, 300, 400 and 600 km event in the same year – because my right-hand gear shifter packed in 400 km into my 600 and I didn’t have enough time in the year to fit another one in, so I’ll be having another crack at that this year. I’m still working my way through the audax calendar to decide which events I’m going to do. Another goal for 2018 is to have a go at mastering the gravel. I spend pretty much all of my cycling time firmly rooted to the tarmac and, as my work colleagues will tell you, I am not much of a mountain biker. I lack the nerve and the skills – I can barely get myself across Houndkirk in one piece. Nice, flat Greek gravel in the sunshine – about the limit of my current capabilities. I’m hoping that the gravel will be somewhere in between the two extremes – just far enough out of my comfort zone to make it an interesting learning curve but not so far out of my reach that I end up throwing the towel in. Those of you that followed us on social media while riding the TCR will know that we encountered quite a lot of the stuff on our journey and although I was pretty rubbish on it, once I’d got the hang of it I did start to enjoy it, but there’s definitely room for improvement. I like having a go at new stuff and if there isn’t any difficulty involved then it wouldn’t be a challenge, right? So, aside from my audax goals, rather than one big, long adventure, I’ve got a few mini ones planned instead. Normandicat is a four-day race that circumnavigates the region of Normandy, France and Julie and I are competing as a pair again. I really enjoyed the free-route aspect of the TCR, even though we made loads of mistakes, as it feels much more like your own adventure when you get to decide your own route so I spent quite a long time looking for something similar on a smaller scale that wasn’t taking place mid-summer. Let the route planning commence. The Normandicat fulfils most of that criteria – it’s an unsupported, free-route race of around 900km with nine control points. It starts in Bayeaux (of tapestry fame) at 10pm on Wednesday, 9th May and finishes on Saturday, 12th at 7pm. You can also choose to complete sections of the route off-road if you want to and I’m thinking that we should get some wider tyres on our road bikes and hit the unsurfaced roads. I’m looking forward to riding in a pair with Julie again as we work well together as a team. We’ve not ridden together since Julie broke her arm at the end of September and she’s still not back on the bike yet. But she has been keeping her fitness up on the Wattbike and we still have a few months to get some big miles in so I’m not panicking yet. I do like to throw myself in at the deep end and what better way to commit to mastering the gravel than to a enter a 200km event that’s full of the stuff in just four months time? It could, of course, be the daftest idea I’ve ever had. There’s a time cut-off point at 10 hours for the 130km mark so my aim is to just try to make the cut-off. 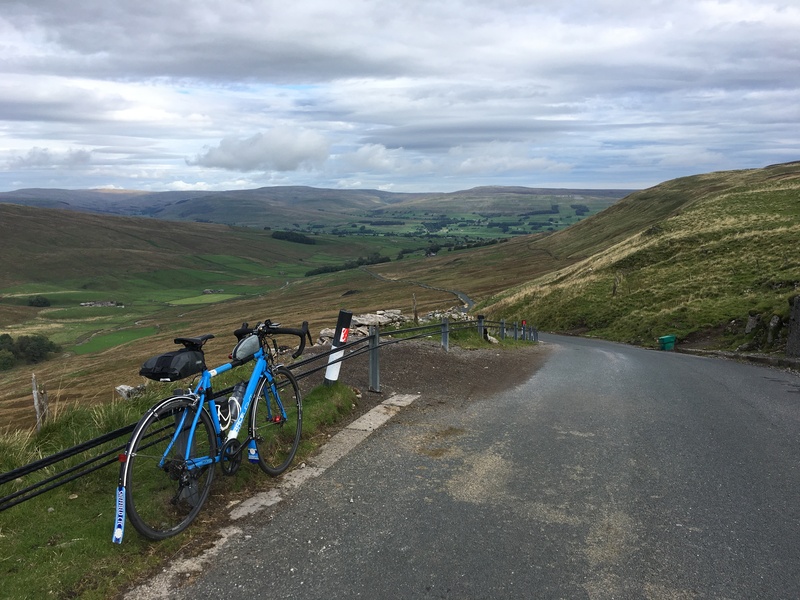 There’s also 3500m of climbing and while I’m not so bad at going uphill, I am pretty ropy at going downhill, so I need to get practising …I think I’m going to need another bike! Everyone I know who’s ridden the Etape has loved it and as it starts in Annecy this year – one of my favourite places in France – I decided to enter. I’m not massively into huge sportives but I do fancy the opportunity to ride a couple of classic French climbs on traffic-free roads. I’ll be going with my friend Andy and this trip is much more of a holiday rather than a challenge, although the event itself will be tough day. I’m sure that most people taking part will be doing it on super-light carbon road bikes but jumping on a plane with my best bike in a box just to ride the route and then flying back home again doesn’t really appeal to me. Instead I’m planning on getting a bit of touring done too so I’m hoping to take a fully-loaded Teacake to somewhere in France on the train and then riding over to Annecy. Ideally, if I had loads of time we would ride there and back but I have less than two weeks and Andy’s idea of a long day in the saddle isn’t quite the same as mine any more. As I don’t want to be away from work too much during the summer months, Torino-Nice in September fits in well with my plans for 2018. This will be the third year that the rally has taken place. It’s a mixed-terrain 700km route that takes in some high cols in Italy and France, including the Col d’Izoard and the unsurfaced Colle Finestre – but by September I’m bound to be a gravel expert, right? It’s not a race and you can take your time if you want to – there’s no official finish cut-off time. I’ll be hoping to do it in around a week, but don’t hold me to that. I also want to get some mini-bikepacking / bivvying weekends in around the UK this year. Last year really rekindled my love of sleeping outdoors. I love the simplicity of getting everything you need on the bike, not worrying too much about accommodation and just riding until you feel like it’s time to stop. During the Summer months there’s something magical about getting up as the sun is rising and hitting the roads and trails while everyone else is still sleeping – for a brief moment it feels like the world is all yours. The last goal I’ve been wrestling with is my annual distance target. I managed to pedal over 18,000km in 2017 but 4000 of those were in the 20 days during the TCR so I’m not sure that I’ll be up for reaching those dizzy heights again this year. As a starting point I’ve pledged to ride 15,000km with 10000km.cc – I’ll aim for that and anything over and above is a bonus. Author adminPosted on July 12, 2017 Format LinkCategories Audax, Kit, Transcontinental RaceLeave a comment on Are you sitting comfortably? If you’ve been keeping up with previous adventures you’ll know that Peter, Julie and I successfully made it to Teddington earlier this month on our DIY 300km ‘Sheffield to London’ Audax. After a short but restorative night’s rest at Peter’s sister’s house we were up early again the following day, back on the bikes and on our way over Richmond Park to Wimbledon Common and the 8am start of the Ditchling Devil 200km audax. The 205km audax route takes riders through South London and over the North and South Downs the outskirts of Brighton, taking in Ditchling Beacon along the way. From Brighton the route climbs back up over the South Down to Devil’s Dyke before descending into West Sussex and Surrey before climbing over the Surrey Hills and following the Thames into Richmond. With a £15 entry fee the Ditchling Devil is a little more expensive to enter than your usual audax, which is usually around six to eight quid, but for the additional entry fee the organisers provide food, with the help of local community groups, at three village control stops along the route. Getting over to the start of the audax was enough of a challenge in itself as rather than pedal all the way around the Common we decided to try and take an off-road ‘short-cut’. When I lived in London I used to run with Belgrave Harriers and their club house is based in Wimbledon. Every Saturday morning my club mates and I would run across the common and over to Richmond Park for training, so I knew which direction we needed to head in, but let’s just say that it’s much easier to get up to the windmill in a pair of trainers than it is on 23mm tyres. After our wibbly-wobbly detour through the woods, we finally emerged at the top of the Common and into the Windmill cark park to be greeted by literally hundreds of cyclists. 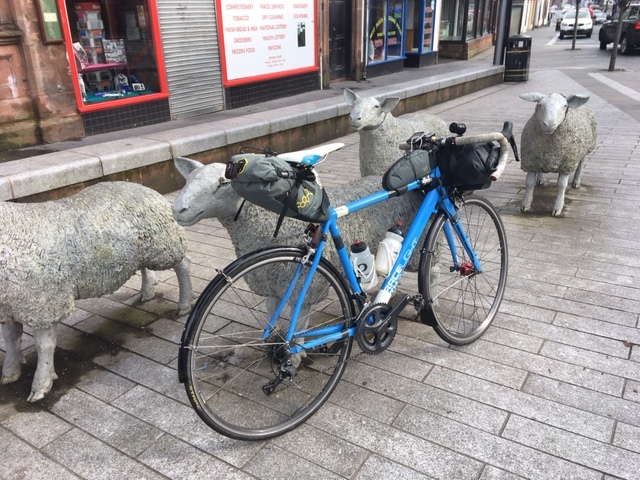 The three of us were a bit taken aback by the sight of so many riders at the start of an audax as we are accustomed to seeing around 50 or so riders at the starts of most of the events we take part in. There had to be well over 300 cyclists milling about, eating donuts and waiting for the 8am off. We started to get the feeling that the Ditchling Devil 200 might not be quite like your usual run-of-the-mill audax events. We parked our bikes and took our place in the line to sign on while each stuffing down a donut. We were a little disappointed not to have coffee at the start but I guess providing coffee for this many riders at an outdoor sign-on would’ve been pretty hard work logistically. After picking up my brevet card I took my place in the queue for the ladies toilets. Yes, that’s right, a queue, for the ladies. All female audax cyclists will know that we never have to queue for the ladies toilets, there just aren’t enough of us usually taking part – in fact we usually have to kick the blokes out of our toilets at most events. However, the Ditchling Devil had a lot of women entrants, which of course is great to see, except that they all seemed to be in ahead of me in the toilet queue. We decided to hang back at the start to avoid the crowds as we sped away from the common down Wimbledon hill and started our journey through the suburbs of south-west London. This audax definitely had the feel of a sportive to it and despite trying to hold back the three of us inevitably got sucked into a few of the big groups of riders on the road as small groups jockeyed for position, getting bunched up at red lights then trying to out-sprint one another on the green signal. The sheer number of riders led to a few uncomfortable moments at junctions, especially when a lot of cars and buses were also queuing to get through, but as we left the suburbs behind and headed to the hills of the North Downs the bottlenecks soon settled down as the stronger riders pushed on up the first couple of hills and riders started to spread out along the route. The first big pull came at Chipstead and despite riding on tired legs from our 300 the day before, the three of us were climbing pretty well and did our own fair share of overtaking other riders on the hills. 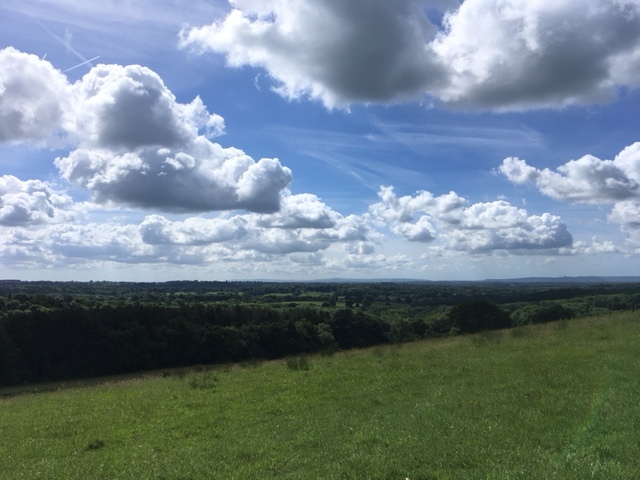 Once we were beyond Reigate the hills settled out into a more gently undulating landscape as we headed toward the first control and feed stop. The control appeared out of nowhere as we were guided into a field at the crest of a country lane where a couple of people with lists of rider numbers applied stickers to rider’s brevet cards. We were advised that the first food stop was a couple of kilometres away in the village of Highbrook and with the promise of egg and bacon sandwiches ahead we were off down the road. It was pretty easy to spot the food stop as there were so many riders spilling out of the farm garden and into the lane. We had a little chat with the farmer who told us that the whole village come together every year to help feed and water hungry riders who are in search of breakfast. 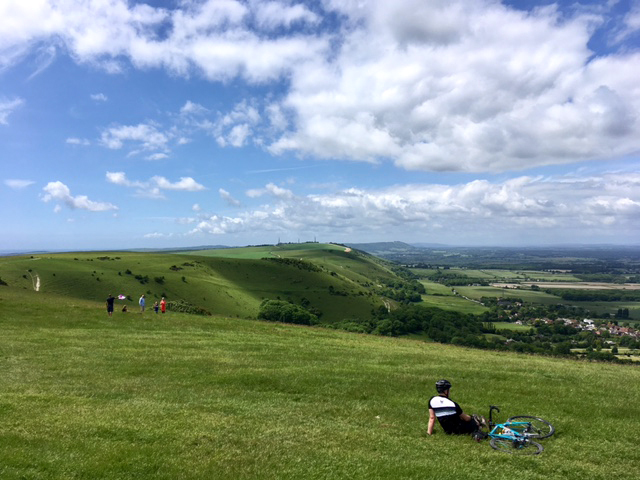 After our egg and bacon roll and a cuppa we thanked him for his hospitality and were back on our way pedalling through the Sussex lanes toward the South Downs which sat on the horizon like a big green wall – a wall we needed to climb up and over before our descent into Brighton. Ditchling Beacon, the famous climb over the Downs that features in the London to Brighton bike ride is not to be underestimated. At 1.5 km long it might not be in quite the same league as a few of the tougher climbs we have up here in the north but it’s still a formidable 16% at its steepest gradient and averages 9% overall, so on a hot day it’ll certainly make you sweat a bit and get out of breath. Today our ascent was further complicated by a steady stream of Sunday drivers all out for a day in the sunshine. The climb’s not quite wide enough for two-way traffic and bikes and some drivers were taking quite a few risks overtaking cyclists without giving them much room. Around half way up the traffic ground to a halt in both directions as a bloke on a bike had to pull up suddenly due to severe cramp. A concerned driver in a Range Rover parked up and jumped out to check that he was ok, which was very good of her, but her vehicle was blocking the road in both directions, causing trouble for drivers and cyclists alike. After a few starts and stops – never a good thing on a 10% gradient – we managed to weave around the static traffic and make it to the top where we took in the fantastic 360 degree view across the Downs to the Sussex coastline and sea beyond. From here the road descended into the busy outskirts of Brighton before climbing back up a few sharp little climbs, one at least 20%, to the top of the ridge and on to Devil’s Dyke where we were rewarded with another fantastic view and an info control. After a quick breather and photo stop we were soon descending back down into the lanes of the Weald. Drivers taking part in the London to Brighton Classic Car Run were passing us going the other way and we got to see fine examples of classic vintage motors as we pedalled our way west for a much-needed lunch stop at Upper Beeding. Every now and again mini pelotons of club cyclists would speed past us and it was hard to resist the temptation to speed up and jump on the back but with 300km in our legs from the previous day I don’t think we’d have held on for long. Lunch was being provided for us in the event organiser’s home. The whole house and garden had been turned into a giant feed station with lots of volunteers preparing and serving industrial-sized quantities of pasta, chilli, bread and rice pudding and riders were scattered everywhere inside and outside the house. The afternoon heat had picked up considerably and I sheltered in the lounge to get out of the sun after lunch while Peter and Julie stayed in the garden. We hung around a little longer than we ought – Peter even thought he might’ve nodded off for a while! Much of the next section of the ride was on fast main roads and we had a few scary encounters with close passing traffic. These encounters seemed to increase once we crossed over into Surrey, with much swearing and hand gestures – mainly from me! Riding through Surrey was a real trip down memory lane for me as I lived in the village of Alfold for a while when I first started working in London in the 1990’s and once I’d moved into the the city I’d often return to this part of the world for training rides. The villages haven’t changed much but the drivers have definitely got more impatient. Our final food stop was in the village of Chiddingfold at the cricket club. Once again we were supported by a host of volunteers handing out cups of tea and coffee and a fantastic selection of homemade cakes and biscuits – just what we needed to get us through the last 40 km over the Surrey hills as the three of had started to flag a bit by now. Many of the other groups of riders were also taking their time at this food stop, maybe in anticipation of the few remaining hills ahead. Julie and I had been keeping a sharp eye on Peter for most of the ride as he can be prone to missing turns and pedalling off in the wrong direction. He’s also managed to cultivate faffing into an art form, leaving gloves and water bottles in his wake at controls. This feed stop was no exception as we handed his gloves to him again. We were starting to wonder how he would manage without us when he rides LEL this summer! I knew that even though we only had 40 km left to ride we still had the last of the big climbs ahead – Combe Lane at Shere. It starts off relatively tame but banks up to 18% by the swtichback at the top and on our tired legs it was really tough going to drag ourselves over the summit. After Combe Lane it was all plain sailing back over the M3 and M25 into the outskirts of London and we managed to cover the flatter terrain pretty quickly by working together taking turns on the front. 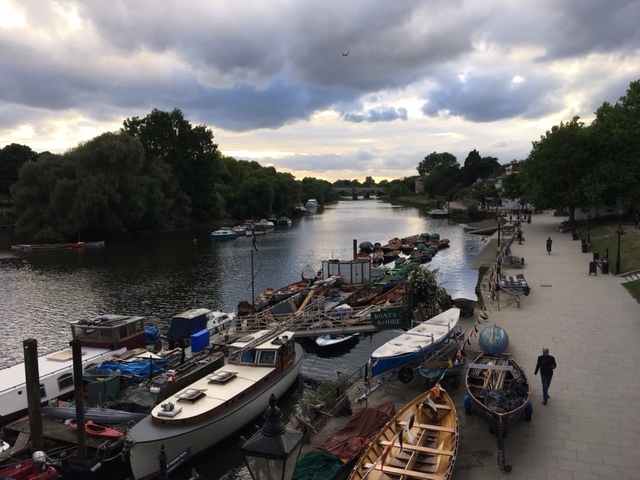 I managed to get all the way to Kingston before blowing up after a fairly long stint on the front and had to limp home on the back being pulled along by Julie and Peter along the Thames to Richmond and the finish at the Rose of York pub. We clocked in at the pub just a little after 7 pm, pleased with our efforts considering that we’d now clocked up over 500 kms of riding in two days. We all agreed that it wasn’t really like any audax we’d done before but we’d really enjoyed it. The organisers really do deserve a big ‘thank you’ for the amount of organisation that went in to providing food and assistance for the huge number of riders taking part – an absolute bargain for the 15 quid entry fee. Cafe stops on audaxes can often result in quite an expensive day out but I’d only spent 75 pence all day! If you live in the south and haven’t moved up to a longer distance audax yet then this 200 would be a great one to start with. 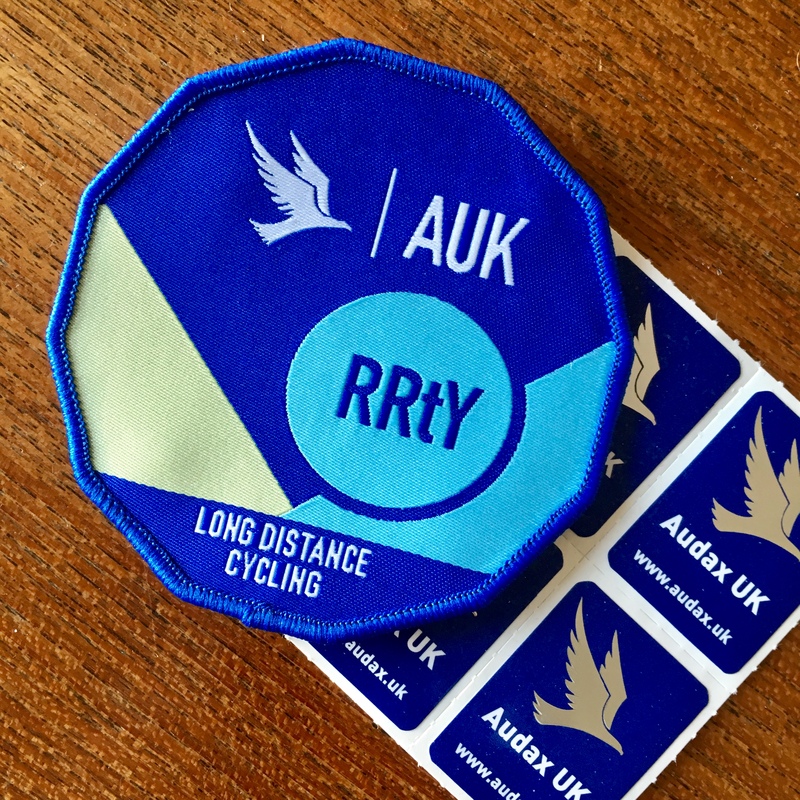 It’s a long way to come for an audax if you live in the north but it’s definitely one to make an effort for, experience some of the best bits of the North and South Downs and make a weekend of it… just make sure you’re prepared for that toilet queue, ladies. Over the weekend Julie and I decided to give our Transcontinental bike and kit set-up a decent trial run on the Hot Trod 400km Audax which starts north west of Newcastle-upon-Tyne and heads out west into the Scottish Borders and over to Lockerbie, before heading north east to Moffat and along the Tweed valley to Peebles. Finally heading back into England via Cornhill-on-Tweed and down to Morpeth. 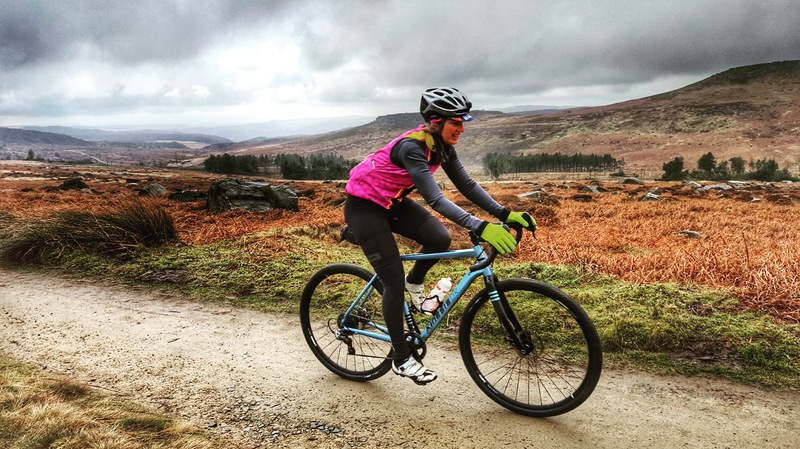 It was Julie’s first 400km audax and, understandably, she was a bit apprehensive. 400s are never easy, even after you’ve got a few under your belt and you know what’s coming. A 300 can be completed in a (long) day, even if it’s a tough one and you’re a slow rider but with a 400 the time allowance is 27 hours, so unless you’re a super-speedy rider, you’re almost certainly going to be riding into the dark and possibly all the way through to the following dawn. The Hot Trod starts at Kirkley Cycles, a farm that also happens to be a great little bike workshop and cafe around 10 miles north-west of Newcastle. It’s a 400 with a few differences and it bills itself as a great ‘first time’ 400 event. First up, it starts at a very civilized 9.30am which, on the surface, sounds great but starting late start also means finishing late. The 27-hour time limit equates to a cut-off time of 12.30pm the following day. As it usually takes me around 23 to 24 hours to finish a 400, that meant a finish time of around 9.30am the following morning, riding all through the night, and with heavy kit on the bikes it could be even longer. However, the second difference is that the Hot Trod provides a rest stop with an option to sleep at the 314km mark in Cornhill-on-Tweed Village Hall. Most 400s don’t provide a sleep option because they start at 6am and riders are expected to push on through to finish in the early hours of the next day. The route is very straightforward to follow as it sticks to major roads for much of the time. This could be a problem in many parts of the UK but up in the Borders there aren’t really that many roads to choose from and most of them are pretty quiet. The route has also been very well thought out so that the A-roads that are likely to carry more traffic are tackled early in the morning or late at night for the majority of riders. 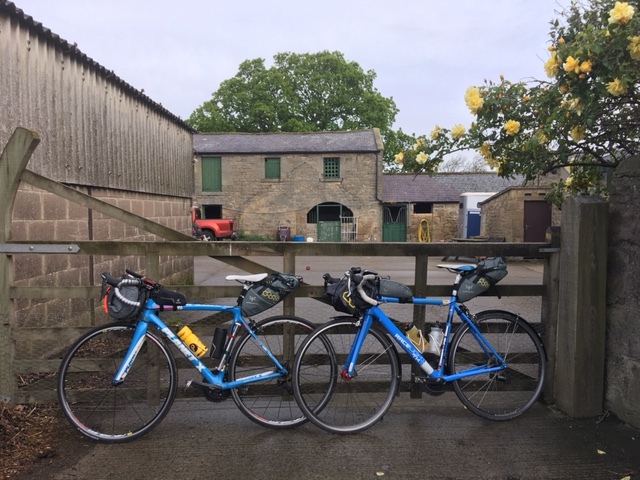 We travelled up to Newcastle by train on the Friday afternoon and rode the 15km to our overnight bunkhouse accommodation at Houghton North Farm in the village of Heddon-on-the-Wall. After a quick wander around the village to find the eponymous ‘wall’ we retired to The Swan for a bit of carb-loading with a giant sized portion of fish and chips plus pudding. After a very early night we were up early to pedal the 10 miles up to Kirkley. We’d arrived with a good 45 minutes to spare and the cafe was open early so, after signing in, a couple of strong cappuccinos were ordered to help us start the ride with a bit of a caffeine kick. Around 50 riders had signed up for the event and we bumped into lots of friendly faces. John Rowe and his mate from Stocksbridge CC were riding as well as John, Ian and Gordon who I met when we all rode the PBP with back in 2015. Audax, especially the longer distance events, is quite a small world really so you’ll often end up bumping to the same bunch of people throughout the year. At 9.30 we were set off by the race organiser and the 50 or so riders were soon dispersed along the B-road that led us over to the A696, so Julie and I were pretty much riding alone from the off. After around 20km we were caught up by a group of riders from the VC167 club including my mate Gordon so we had a bit of a chat with them (mainly about our new Rapha bib-shorts and comparisons with Asos!). Julie and I had a bit of a game plan as our bikes were fully-loaded with our TCR kit and were very heavy, so we wanted to pace ourselves at a steady 20km an hour, limiting our stops to 30 minutes, and ride alone rather than get caught up in a group and ride at someone else’s pace, so when the group stopped to put on rain jackets we carried on down the road although they soon caught us up and passed us on the steady climb up Carter Bar and the Scottish border. It had been drizzling slightly all the way through Kielder up to the border, where we stopped to take the obligatory stop of the bikes by the border stone, but as soon as we crossed into Scotland and turned on to the A6088 to Hawick it was like someone had turned the hose on and the rain came down hard, stinging our eyes and causing us to be more cautious on the descents. Thankfully my old and slightly worse-for-wear Endura waterproof did what it does best and kept my core dry but hands and feet were not so lucky. I’ve really put that poor waterproof through it’s paces over the past three years but it’s never let me down. Eventually the rain eased off but not before we were completely soaked. By the time we arrived in Hawick, the second control and first major stop at 89km we’d more or less dried out except for our very wet and cold hands and feet. I’d decided not to bother with bringing any overshoes as it was just more weight to pack but I was starting to regret that decision. Morrison’s supermarket cafe had been suggested by the race organiser and as we pedaled into the car park and saw all the bikes leaned up against the shop window it looked like everyone had followed his advice. We arrived at 1.30pm – the height of lunchtime for hungry Saturday shoppers – so the queue was long and service was pretty slow-going but we managed to get fed and out within 45 minutes. After Hawick the route took a turn on to the scenic and deserted B711 and despite the overcast skies and on-and-off showers the landscape was beautiful. Eventually we turned south on to the B709 and climbed steadily, following the the course of the river Ettrick Water upstream to the village of Ettrick. As we started to descend into Eskdalemuir I noticed lots of brightly coloured flags fluttering in the distance by the roadside. 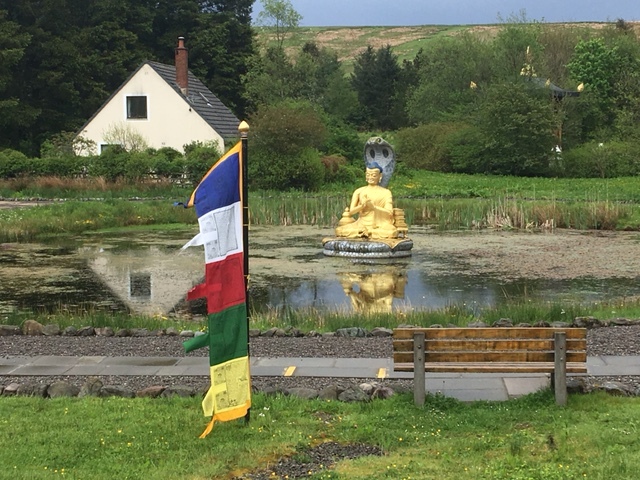 As we got closer we were greeted by the very surreal sight of a golden buddha sat in the middle of a pond. We learned that was the Kagyu Samye Ling Buddhist Monastery. This was the first Buddhist monastery to be set up in the West and it’s pretty easy to see why they chose this beautiful, quiet valley to host their retreat. At Eskdalemuir we turned onto the B723 which was to take us into Lockerbie and the next control stop. We got caught in yet another rain shower on the way down and by time we arrived in the town it was 6pm and we were wet, cold and hungry. We stopped at a cashpoint to get a control receipt and Julie’s hands were so cold that she couldn’t manipulate her fingers to use the machine. The recommended food stop, Lockerbie Truck Stop, was still another 7km up the road. We piled into the warm and welcoming truck stop cafe and ordered two massive portions of food and steaming mugs of strong tea. A lot of the other riders were in there so we all had a good old moan about the weather and lined our gloves, socks and buffs across the radiators. The lorry drivers didn’t really bat an eyelid but I bet they all thought we were completely bonkers. We left around 7.15pm and headed up the road to Moffat which wasn’t an official control but was our last chance to stock up on nibbles before the climb up and over the Devil’s Beef Tub, or to use it’s far duller name, the A701, to the next control at Peebles. 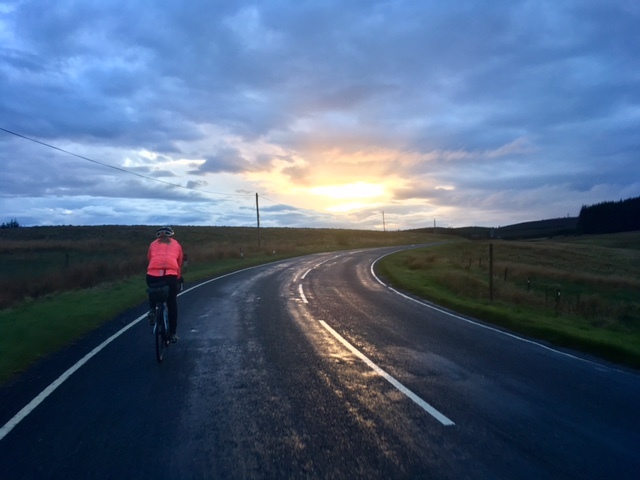 The sun was starting to set as we reached the top of the climb and started the long descent along the Tweed Valley and the sunset through the stormy rain clouds reflected up from the puddles making the roads glow with pink light. By the time we reached the valley bottom it was starting to get dark. I often find the time between dusk and proper nightfall the hardest time to ride through. It’s not completely dark but not light enough to really make anything out. My eyes don’t seems to adjust very well and it’s harder to see the road surface ahead even with good bike lights. My pace always slows down at this point and this night was no exception. Peebles never seemed to get any closer and we finally arrived in the town at a few minutes to 11pm. We found a group of riders huddled outside a McColls which was planning on closing at 11pm. We quickly leaned the bikes against the shop window and rushed in but once in there we were both so tired and disoriented that we didn’t really know what to buy. It didn’t matter really, I just needed some sugar and a receipt so I bought a packet of Jelly Babies and a large bottle of Coke. Outside I realised that Julie had decided to leave without buying anything and by then they wouldn’t let her back in to get a receipt, so while I fumbled with my supplies and downed half the Coke, Julie went in search of a cashpoint. Peebles and the 18 miles to Galashiels was probably the low point of the ride for me. I had a real dip in energy, Julie was riding a good 200m ahead and I just couldn’t muster the energy to try to to catch her up. I rode with a friendly Welsh guy for a while and he spurred me on to Galashiels where we found an all-night garage with a toilet and a Costa coffee machine – heaven! It’s amazing just how much a warm building with a toilet and rubbish coffee can perk you up at 1 in the morning. Now it was proper dark and we had around 30km to go to the rest stop at Cornhill. The route out of town was well-lit on a main road with street lights almost all the way to Kelso which made the going a bit easier. The coffee had perked us both up and we were doing alright. After Kelso the roads were unlit again but by now in the total darkness my eyes had adjusted to it and I’d settled into a good rhythm. We were joined for a while again by the VC167 group and we hung on the back for as long as we could before their red tailights disappeared into the distance. At the village of Cornhill it took us ages to find the control as the village hall was tucked away on a side street and we were getting a bit flustered in our tired state and kept missing the turn. The sky was just starting to get light again when we eventually arrived at 3.15am. Once inside, we had our cards validated and were offered a macaronie pie and baked beans. We sat down at the long table with a big group of riders, most of them from VC167. We were all in good spirits considering we’d all been awake for a very long time and were kept entertained by Gordon and his banter. Wet socks, shoes and gloves were removed and piled up on the radiators to dry. The Cornhill control was at 314km so Julie and I figured that we could get our heads down for an hour and wait for a bit more daylight before heading off on the last 90kms which we’d reckoned on covering in around five hours. And, seeing as we’d carried our sleeping bags and bivvys all the way around the route it was time that we put them to good use! Even though we were indoors I couldn’t be bothered to pull the sleeping bag out of the bivvy and just crawled inside the lot, which meant I’d totally overheated in the next five minutes and had to start wriggling around like a demented caterpillar removing bits of clothing while inside. I’m not sure that I slept really but Julie was convinced she’d heard me snoring, anyway just being horizontal for an hour was a welcome rest. We were up again at 5am and after a bit of breakfast we thanked the lovely support crew for their help and were out of the door by 5.30am to be greeted by a beautiful, sunny morning. The route back south was very straightforward, along the rolling A697 which skirts the edge of Northumberland National Park, through Wooler and on to Morpeth. However, to make up the distance there was a final info control at Ulgham which meant that we turned off the A-road at Longframlington and back on to the B-roads. these proved to have a sting in the tail with a couple of short 10% hills on poor road surfaces – not exactly pleasant on tired legs and one hour’s sleep. Along the route we caught up with a father and son pair. The little lad was only 13 – what an amazing achievement to ride 400km through the night at that age and what a great bonding experience to have with your dad. By the time we hit Morpeth around 9.30am we were very glad to be on the home stretch. Up to this point the roads had been very quiet but there was a bit of traffic in the town centre and a couple of pretty impatient drivers in 4x4s made our lives a bit difficult on the climb back out of the town. The final stretch of road back to Kirkley was into a slight headwind and it felt really tough. I have to say that the Brevet shorts that we’d been given by Rapha had held up really well but no shorts are ever going to feel pleasant after you’ve had them on for 24 hours and 395km so we were getting up out of the saddle quite a bit at this point to ease the pressure points. After a quick glance at our watches we realised that we could just about get in before 10am if we picked up the pace for the last couple of kms, so we managed to find a bit of extra from somewhere and made it back to the farm gate by 9.57am, 24 and a half hours after we’d started. We were warmly welcomed back by the VC167 crew and cafe staff, very tired but very happy with our time and satisfied that the kit we’d carried with us had done the trick. 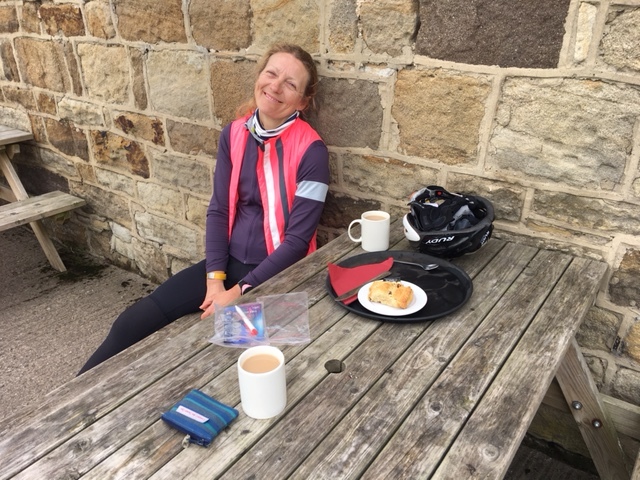 After a good hours rest with big mugs of tea and bacon (me) and fish finger (Julie) sandwiches we were back on the bikes to Newcastle and on the train to Sheffield. We’d both had our low points on the ride, sometimes at the same time but not always. 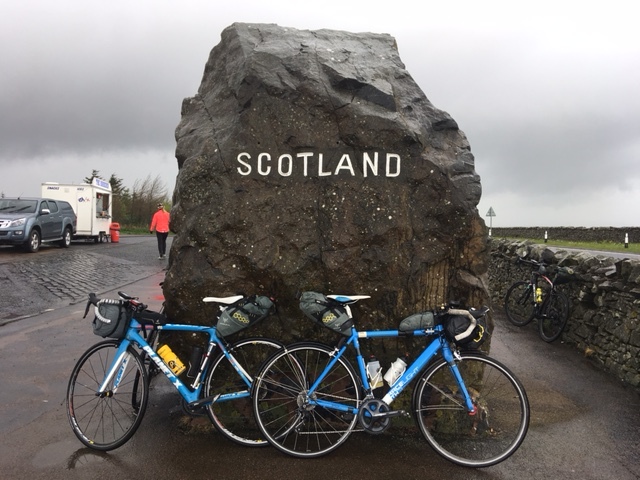 We’d battled the lousy Scottish weather and got horribly soaked but we’d cycled through some stunning scenery on deserted roads that were still beautiful despite the cloudy, heavy skies. 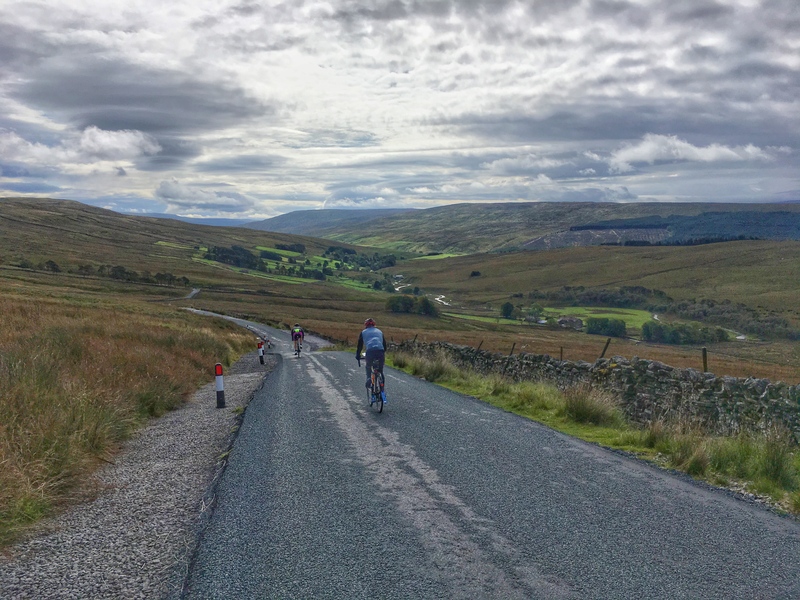 We ate our own body weight in junk food and shared the road with friendly, supportive riders – and that’s what audaxes are all about. I enjoyed it so much, I’m already thinking about going back to do it next year.